Anyone who has followed Batman in the comics will know that my title 'Financial Crisis' for episode one of Bat Storm is a kind of play on words of the 'Final Crisis' DC series of comics. However from there, beyond the obvious parody of Batman himself, Bat Storm doesn't draw much from the Dark Knight's legend. Bat Storm is a single dad, working class superhero fighting crime with his superhero daughter Bat Flash. Funding their crime fighting through children's party appearances. In episode one, part one, money becomes tight when two REAL superheroes and a clown muscle in on their turf. The idea for Bat Storm's series began with the Will Smith superhero movie Hancock. One of that movie's key themes was the destruction created by Hancock whilst carrying out his business of fighting crime. Who actually pays for all that collateral damage? This question makes you look at films like Christopher Nolan's The Dark Knight from a whole different perspective. You start to tally up the cost of the damage where Batman deliberately destroys public and private property as a means of intimidation (see one scene in the movie where the Bat mobile is used to great effect, firing missiles in an undercover parking lot as 'intimidation'). The other major influence behind Bat Storm is a little known British TV comedy series called No Heroics. This series features numerous superheroes with questionably unremarkable powers and little idea about how to capitalise on them. Grabbing any kind of publicity they can get even if it means school yard and birthday party appearances. The series focuses more on what superheroes do in their down time and how they feel about other more successful superheroes, in particular, Excelsor, the most famous superhero in the country (who is something of an A-hole in his off duty time). No Heroics is a very funny series that tries to show that superheroes do have regular lives (and normal failings) between the heroics. Especially noting that these heroes are mostly working class and live in the suburbs like you or I rather than in big enigmatic mansions with unlimited funds. It would probably be a fair comment to say Bat Storm the series draws heavily on some of the ideas in No Heroics. 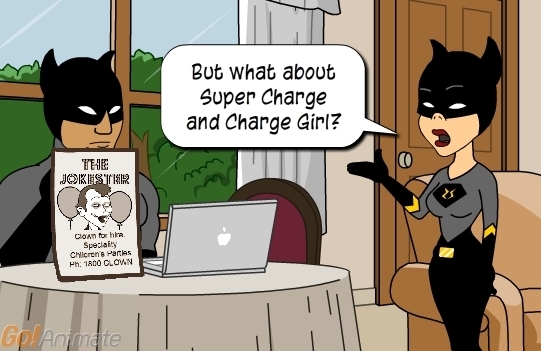 For example, although my character, Super Charge, is a Superman parody, he actually shares many of No Heroics, Excelsor's personality traits (big arrogant ego when he's not being a Superhero). I've already talked about the concept of Bat Storm in Bat Storm Coming to GoAnimate so I won't repeat any more of that ground. However in a later blog about my Dark Knight/Bat Storm Trailer I commented that my finished trailer gave me pause to think that Bat Storm could be more action movie like than TV sitcom. At about that time I'd already finished the first two scenes of Bat Storm which I put on hold whilst I made the Bat Storm Trailer for a GoAnimate Contest. When I finally came back, months later, and reviewed those scenes I felt they were too good to just abandon and change tack. The result being that Bat Storm will remain more of a sitcom but I will be trying to slip in a few action sequences too. In terms of behind the scenes work on this first part of episode one there is a lot of custom work in order to allow Bat Flash to kick in the door of the convenience store. The door its self is a custom flash prop that I created specifically for this scene (but also used it in my Dark Knight/Bat Storm trailer). There's also a lot of masking around the door so Bat Flash can walk outside the store as the original GoAnimate background doesn't permit this. Beyond that there is very little custom work apart from the Jokester's poster and the police car (which is also a flash creation specifically for this series). Originally I'd wanted to record real voices to play all the characters but this series has too many characters and I didn't want to delay things longer by looking for more people. GoAnimate recently implemented Text-To-Speech voices for site wide use and they added in a hand full of additional voices. I decided to feature these instead. Although they're very robotic, they kind of work and I've left the speech balloons in so people can read words they don't understand, as well as get some hints at the emotion some lines are actually ment to contain. My focus is more on the script and telling a great story rather than flashy effects. So far feedback on this episode has been positive confirming that the script along with how I've edited the scenes is what people are really responding to. That's really gratifying since, as I write this, there currently is no script for part two of episode one other than an opening scene. Unlike other animators I don't write scripts before I start animating. I start with ideas and scenes and see where they take me as I animate. When I started part one I didn't know Bat Storm and Bat Flash would be sitting on train wondering what had gone wrong with their status as superheroes by the end. Ultimately I do know Bat Storm will bounce back but I don't yet know the details of the journey there. I have been creating characters for the series that have yet to appear but whether I use them I don't know. They're just vague ideas. For example you may or may not see a Cat women like character in this or a future episode of Bat Storm. Finally, I wanted to mention that I've continued my tradition of self referencing other of my previous animations within scripts. You don't need to know the references to know what's going on but it adds another level for my regular viewers. In this part of episode one the Water Cooler Valet job is a reference to my Animator Dominator Competition animation which featured unusual jobs including Water Cooler Valet and Hat Stand Monitor. Part two of episode one I'm hoping to release by early December 2010 but given I'm still making it I can't guarantee that. When it is released no doubt I'll write a blog post to accompany that with more behind the scenes insights. ha ha ha... that trailer for No Heroics is hilarious! Thanks for sharing. I think there is also a kind of sadness in-between all the comedy. Maybe to be defined as bitter-sweet? It reminds me a bit to The Incredibles, where the father is really depresed to be doing an office job when deep in his heart what he really would like to be doing is... being a superhero. Excellent post, as usual, TET. @Nicolas - if you ever get chance to see the full series of No Heroics I highly recommend it. @Gipsy - the direction this episode of Bat Storm went kind of surprised me. I never expected to be heading into emotional teritory at all. Bitter-sweet is a good way to describe it. Both The Incredibles and Watchmen are favorite films of mine. When I first saw Watchmen what I liked about it was that it dealt with superheroes in their regular lives and particularly the storyline of how they evolved from the original costumed superheroes that came before them. I might know of a great source that animator's can tap into for voice talent. There is an entire community of musicians that might be willing to donate voice tracks. For example I have all the recording equipment to do voice overs and know a few females that might be interested in recording voice tracks on my gear. There are people from all over the world using this site. Sweden, Germany, England, and all over the good ol US of A. Canada and Latin countries as well. Find the forums link and ask around. You might have to join to post though, but this is a great community filled with great people. These guys and gals have a ton of music that they have created, which could work as background music for all kinds of animations. If you use anyones music from Riffworld, please be sure to ask first and maybe offer to post a link in your animation back to the musicians page. @TET please contact me if you would me to try some voice over work on your animations. I really like your BatStorm toon!